Facebook, Twitter, and other social media platforms have become the modern way by which millions of people connect with each other every day. With over 2 billion users, Facebook is the biggest player in the space. This comes with a market capitalization of $499 billion. Word of mouth has always been one of the best forms of advertising for businesses. In the age of social media, the supposed reach of word of mouth has increased exponentially, a single post potentially garnering tens of thousands of retweets. Keep reading to learn more about the astounding growth achieved by social media companies in just the past decade. Since the invention of the telegraph in 1792, society has only sought ways to communicate faster and over greater distances. The invention of the telephone and the radio (still in use today, albeit more advanced) in the early 1890’s came next. After the creation of the Internet and e-mail came the early forms of social media. With the first chat rooms, blogging sites, and networking sites providing the ability to create profiles, social media as we know it was born. MySpace and LinkedIn established themselves in the early 2000s. YouTube pioneered video sharing in 2005. Then, in 2006, came Facebook and Twitter. Facebook has the most active users of any social media platform, and it also owns Instagram and WhatsApp. These two platforms have a younger user base and are perhaps a useful hedge against the increasingly ageing Facebook population. A significant contributor to Facebook’s commercial success has been its advertising platform, second only to Google Ads. Facebook is also advantaged in the virtual reality market with its acquisition of Oculus (maker of the Oculus Rift) in 2014. Facebook experienced the biggest ever one-day market value loss this past summer after news of a poor financial forecast. The company cited a levelling out of the number of people actively surfing the Internet. Twitter and Snapchat also reported declining user numbers. This took place at the same time as the strengthening of privacy regulations in European markets, making the sustained growth of user activity more difficult in these regions. 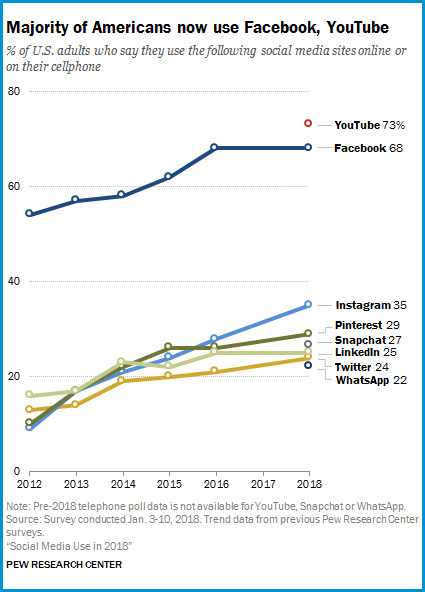 Growth is still happening in some markets outside the US, but it seems that social media companies are looking at other ways of growing their business. Companies are shifting their focus away from attracting new users and towards providing more value to its existing user base in creative ways. This adaptation to changing consumer desires means that social media companies aren’t going anywhere. Facebook continues to be the major player in social media and does not appear to be letting recent setbacks change that. All things considered, it has a sound business model and a diversified set of platforms. Interested in innovative and disruptive trends like social media? The Evolve Innovation Index ETF (TSX: EDGE) provides investors with access to global companies across a broad range of industries.